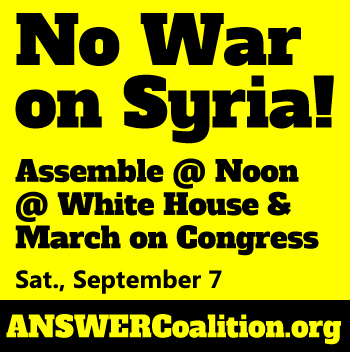 March on Washington to say "Vote NO to war against Syria!" Get on the bus to DC! Help spread the word! Now is the time for the people to step up pressure on Congress and demand that they vote NO to any resolution authorizing a military attack on Syria. Time is of the essence. On Saturday, September 7, people are descending on Washington, D.C., for a major demonstration that will assemble at the White House at 12 Noon and then march on the Capitol Building as Congress returns to and prepares to vote. This demonstration is endorsed by the ANSWER Coalition, CODEPINK, UNAC and many other organizations. Get on the bus to DC! A bus will be leaving from New York City to the demonstration on Saturday morning. Get your bus ticket right now to attend this urgent March on Congress! Get your NYC bus ticket today! and share widely on all social media. 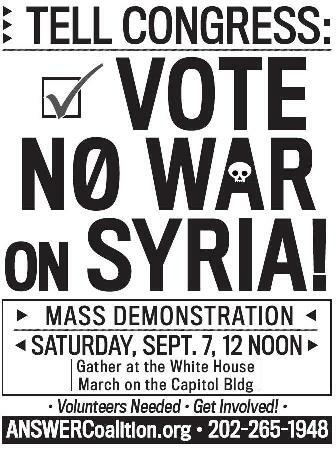 Then on Monday, September 9, the Syrian American Forum is organizing a demonstration at the White House from 10 am to 12 Noon, followed by a march to the Capitol Building. This will be the first day that Congress is back in session. Those who can will stay over in Washington for daily demonstrations, and to maintain a round-the-clock visible anti-war presence at the U.S. Capitol building as Congress meets to take up and vote on the resolution. You can also send an email letter right now to your elected representatives in Congress demanding that they vote NO on the Syria war resolution. If you already sent a letter, you can use this link to forward this email to your friends asking them to also send letters. The voice of the anti-war movement is being heard and the people’s movement is playing a critical role in the worldwide opposition to the threatened US war on Syria. Expenses to carry out these protests are significant and we need you to give as much as you can to help with the work right now. Your contribution will help cover the cost of buses, vans and car caravans traveling from across the East Coast by subsidizing the cost of tickets for those who could not otherwise afford to attend. Please help amplify this message right now with you generous donation to the anti-war movement.